QUESTION: How can you claim that the MeteoHelix is more accurate in a city than other weather stations like Davis, Meter Atmos or Rainwise? ANSWER: Urban weather station installations have their unique set of challenges. Their accuracy is limited by their surroundings since many installations are close to building walls and paved surfaces which accumulate and radiate heat to cause unacceptable air temperature and humidity measurement errors. Today’s weather stations use multi-plate solar radiation shields and fan-ventilated shelters to protect their sensors from adverse effects of heating caused by the sun. Much like the heating that occurs in your car on a sunny day. However, these multi-plate shields and fan ventilated shelters do a poor job of protecting sensors from reflected sunlight and from heat radiating from the ground or nearby walls. That’s where the helical solar shield shines and is the main reason why the MeteoHelix IoT Pro weather stations are able to measure air temperature so precisely in urban environments. The spiral design offers 360 degrees of protection to the sensors from any direct light or infrared heat while providing excellent ventilation and unobstructed airflow to the sensors. The patented design of the helical MeteoShield Professional is the technological bases that allows the MeteoHelix weathers stations to shine above their competition in terms of accuracy and long-term precision of atmospheric measurement in urban installations. QUESTION: Will the temperature peak between two data samples be recorded? Davis, sends data every 5 minutes and shows the minimum, maximum and average temperature with sampling every 2.5 seconds, then on a total of 120 samples. As you can see, the output includes: 10 minute average temperature and minimum and maximum temperature values over the 10 minutes as measured every 15 seconds. 10 minute solar irradiation average and Max irradiation value along with humidity, atmospheric pressure and rain. Yes, the Davis weather stations sample every 2.5 seconds, yet the τ63% reaction time of their Sensirion SHT sensor and passive radiation shield is much slower than 2.5 seconds (we do not have detailed data on the 7714 shield, but know what the Sensirion time constant is, as shown in this picture from their datasheet). Additionally, the 7714 shield has slower reaction time than MeteoShield Pro to temperature changes. What we do know so far from independent studies is that the helical MeteoShield Pro has the fastest reaction time of any passive radiation shield. After taking the aforementioned information together, one can conclude that the 15sec measurement interval for temperature and humidity is more than fast enough as these atmospheric physical properties change much more slowly than wind speed for example, due to the above factors. One must also take into account the time constant of the filter cap used on the sensor, the sensor itself and its thermal mass and the radiation shield time constant. They all add up to a reaction time greater than 30 seconds for 99% of all outdoor meteorological sensors that have decent long-term stability and protection. 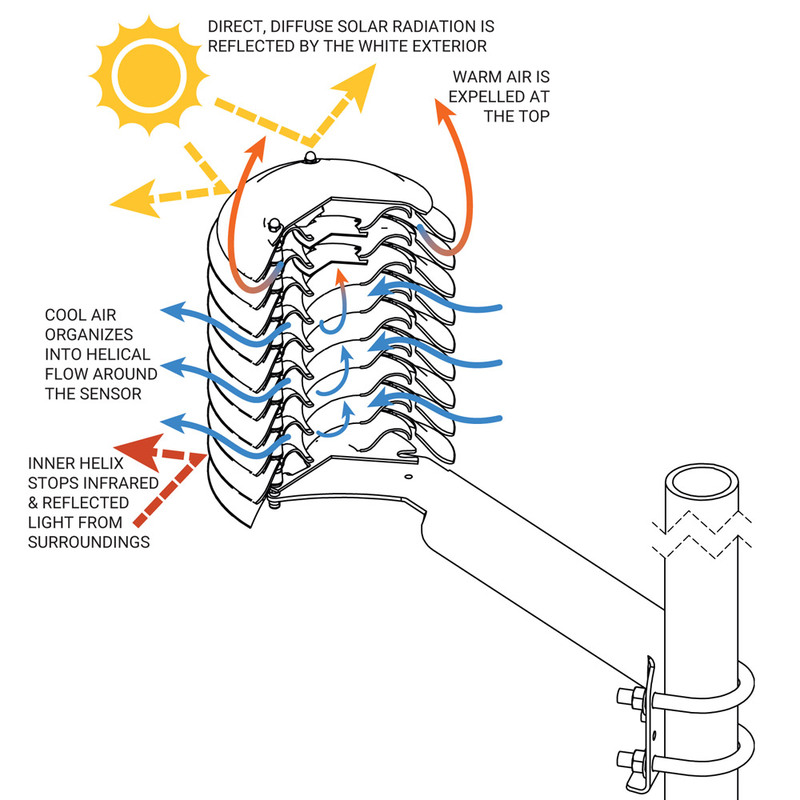 In many situations, the effects of morning dew, rain, drizzle and snow have a significantly higher impact on accuracy as can be seen in fan-ventilated (aspirated) active solar shields which tend to provide unrealistically low temperature readings and unrealistically high humidity readings in these conditions by drawing in moisture and saturating the temperature and humidity sensors. * τ63% response time of sensor with a filter cap will vary based on cap porosity, material and fluid (air) flow. In applications where sensors are used in wet, dirty and dusty environments, we recommend regular inspection of filter cap cleanliness to maintain long term accuracy. Inspection interval should be determined by the application and user experience in their application environment.